You probably missed this one, after all most news coverage told people that Wisconsin Governor Scott Walker signed a "right to work" bill. According to the accounts, this bill means that workers will no longer be forced to pay a fee to the union that represents them. This was presented as a victory for workers' rights over the power of unions. In fact, it was about denying the people of Wisconsin the freedom of contract. This is not just a question of the best slogan for a marketing campaign; it's a question of how we think about workers' rights. 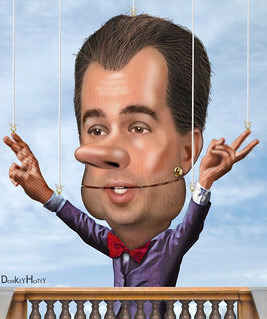 Walker and his supporters want people to believe that a basic right of workers is being denied if they are forced to pay a union representation fee. This is nonsense if we think about the issue in its full context. The problem is supposed to be that some workers dislike unions in general, or the union at a specific workplace, and don't think they should have to pay a representation fee to the union to hold a job. But there are often many things about a job that workers don't like. Often employers demand that workers work bad shifts, starting their shift late at night or forcing them to work on weekends. Employers can demand that workers come in on Thanksgiving or that they put in overtime. They might even do it with just a few minutes' notice, forcing workers to quickly arrange child care, skip doctors' appointments, or cancel other commitments. In this context, the right to work means the right to work somewhere else. If a worker doesn't like an employer making extensive and unpredictable demands on their time, the Scott Walkers of the world tell them to find a different job. And many employers require workers to be kind to the point of obsequiousness with customers. If workers don't feel comfortable wishing a person a good day and asking after their family, as required by the boss, the Scott Walkers of the world tell them to find a different job. In short, the proponents of "right to work" are fine with almost any demand that an employer wants to make on workers, including pay cuts. Their simple answer is that if you don't like it, work somewhere else. The Scott Walkers of the world only have a problem when the demand is coming from fellow workers. The idea of a union contract is that workers collectively are reaching an agreement with their employer that imposes a set of rules for the workplace. The Scott Walkers are only concerned about workers' rights when the issue is enforcement of a contract between workers and their employee. There is nothing about workers' "right to work" in this story. Scott Walker and his backers could not give a damn about workers' rights. This is a bill about taking away workers' freedom of contract in a way that will weaken their bargaining. It is a lie to gloss over this fact and pretend there is some issue of individual rights at stake. There isn't.